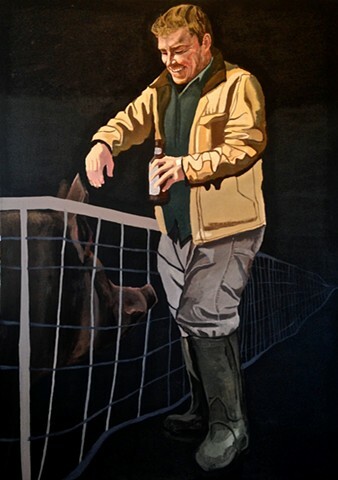 Sovereignty is a series of life-sized portraits that depict small-scale organic farmers with and for whom I have worked. Drawing from classical portraiture like that of Diego Velázquez, the backgrounds of the portraits are without specific spatial context and, instead, consist of a smoky, monochromatic wash. With the farmers removed from their environs, the viewer is more inclined to study the varying level of detail comprising the depiction of the subjects. The faces of the figures, important props, and certain clothing items are rendered in great detail, while less important and non-identifying features are left undone. These stylistic choices and the general size of the paintings portray the subjects as glorified individuals, much like one would depict a sovereign leader. The reality is, however, that these individuals are anything but glorified in their daily lives. Their profession consists of behind-the-scenes work that is physically trying and often visually grotesque. Accompanying these portraits are very small paintings of some of these grotesque happenings on the individuals’ respective farms— for example, a pig giving birth, a falcon gutting a chick, and livestock being slaughtered. Viewers must step back and gaze upward to view the farmers, but walk forward and lean in to view these scenes of life and death that sustain them and us. The title of the show, Sovereignty, refers not only to the depiction of the farmers as important political leaders, but also to their efforts to achieve food sovereignty by rejecting industrialized and conventional farming in favor of an ethical and local food system.